294 pages | 4 B/W Illus. With increasing pressure on resources, the looming spectre of climate change and growing anxiety among eaters, ecology and food are at the heart of the political debates surrounding agriculture and diet. This unique contribution unravels agri-environmental issues at different spatial levels, from local to global, documenting the major shifts in agriculture from a long-term perspective. The book begins by exploring the changes in the industrialisation and socialisation of agriculture over time, through the lens of institutional economics including The French Regulation School and Conventions Theory. 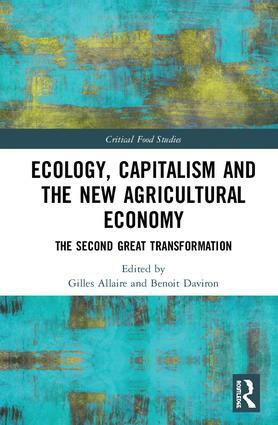 Building on Polanyi’s ‘Great Transformation’, the chapters in this volume analyse long-term and contemporary changes in agriculture and food systems that have occurred throughout the last few centuries. Key chapters focus on the historical changes in provisioning and the social relations of production, consumption, and regulation of food in different socio-political contexts. The future of agriculture is addressed through an analysis of controversial contemporary political claims and their engagement with strategies that aim to improve the sustainability of agriculture and food consumption. To shed light on ongoing changes and the future of food, this book asks important environmental and social questions and analyses how industrial agriculture has played out in various contexts. It is recommended supplementary reading for postgraduates and researchers in agricultural studies, food studies, food policy, the agri-food political economy and political and economic geography. Gilles Allaire is an economist and Emeritus Director of Research at the French National Institute for Agricultural Research (INRA). He was trained as agronomist engineer. His main research topics concern institutions, markets and agricultural policies; more specifically, rural employment, rural development, genetic resources, knowledge systems, organic agriculture movement, geographical indications and alternative food networks. He directed several national and European research projects. He has been a visiting scholar in the Institute of International studies, University of California at Berkeley. He is member of the editorial board of the Revue de la regulation. Benoit Daviron is Senior Researcher at the Centre de Coopération Internationale en Recherche Agronomique pour le Développement (CIRAD) and consulting professor in SupAgro Montpellier, France. He has been a visiting scholar in the Department of Agricultural and Resource Economics of the University of California at Berkeley and responsible for economics and social sciences in CIRAD. For the last 20 years he has worked on agricultural trade and food policies in developing countries with a special focus on the questions of governance and regulation.